Every time a person leaves their house, they are using services provided by their local council. Victorian councils deliver more than 100 different services to their local communities. A range of in-home services are also offered by councils. 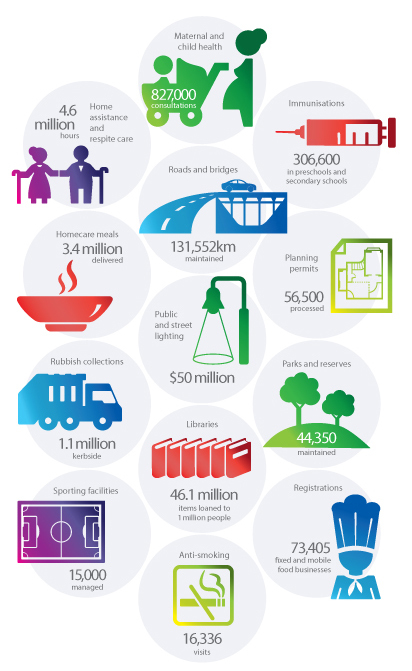 Councils also provide local infrastructure and community facilities valued at $91.2 billion across Victoria. But not every municipality is the same. A council area may have a declining population, lots of young families moving in or an ageing community. They might have only residents, or many industrial businesses, farmers or transient populations that don’t live locally. Regardless of its characteristics, each council must respond to and provide for the needs of its local community. The list of services and infrastructure may vary from one council to the next depending on local community but generally includes diverse service delivery topics from aged care to health, safety, environment to local laws, emergency management, waste and community development and beyond.